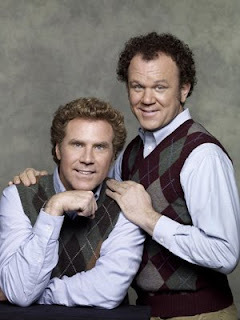 Last year, Will Ferrell and John C. Reilly paired up in the redneck racing flick, Talladega Nights. Honestly, I didn't see that movie because the previews pretty much gave the script away. Just as well, I was burned out on Will Ferrell (he's pretty much the same character in every movie!). Well, I decided to try my fortune with him in his latest film, another with Reilly, Step Brothers. I don't want to give a thorough synopsis of the movie here but I do want to say a few things. Firstly, if I had to describe this film in one word, it would be "raunchy". Seriously, this is straight-up one of the raunchiest films I've ever seen. At the beginning of the show, there are a few jokes about penises and vaginas. 45 minutes later, more of the same. 45 minutes after that, more of the same. Combine all of the genitalia jokes with the tremendous amount of cursing, forced restroom and underwear humor and anyone with a shred of decency feels like they need absolution via water afterwards...or at least a civil adult conversation. Secondly, while this film does have some funny parts, I think the trailers were misleading. Commercials made this movie out to seem quite wholesome; nothing could be further from the truth. This movie amounts to nothing more than profanity and a mockery of good parenting. Sadly, the plot of the film probably plays out in too many families today. Thirdly, I'm sick of seeing Will Ferrell play the same character in almost all of his movies (the same goes for Steve Carrell...whom Ferrell was actually chosen over for a position on SNL). I'm also tired of seeing him move into hokey comedic roles instead of ones that are "actually" really funny. All-in-all, the makers of this film tried too hard to be funny. They went over-the-top and in the process, dropped the ball. I wouldn't reccommend this movie to anyone and it certainly not suitable for youth. Spend your time and money somewhere else!